Choose a bank that will waive or reimburse out of network ATM fees. Contact your banks before leaving home to let them know where you’ll be traveling and for how long. Otherwise, your card may be declined on your first (or sometimes second) transaction. It’s also a good idea so they can actively monitor your account for suspicious activity. Also, grab one of your old wallets and turn it into a “throw away wallet”. Add some expired credit cards, an old ID, about $40USD and a few used gift cards to fill it out. We’ll talk more about this further down the post. Most thieves are well aware of the standard tourist travel fanny pack style wallet or the around the neck wallet. Then again, these can also be used as an added layer of protection as decoy throw away wallets. Alternatively, this very unassuming belt allows you to stay cash inside of it and comes highly recommended by many travelers. You can request pesos from your bank at home but really there is no need. 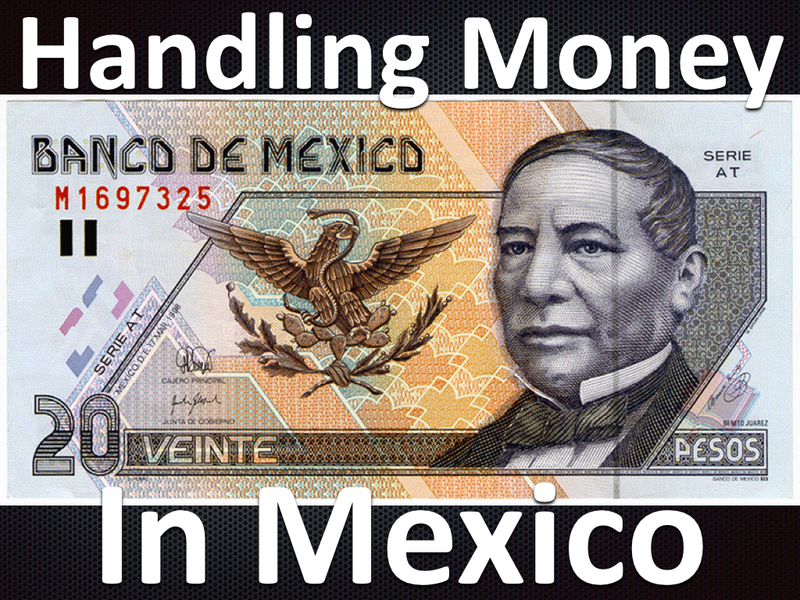 All of the transaction when crossing the border into Mexico can be paid using your US dollars. At most crossings, there is a bank near the border where you can pull out pesos. Especially if you’re planning a trip further south after Mexico, consider taking a stash of “emergency money” in 20 or 100 USD bills. Enough to use any sort of big emergency that might arise. Take extra caution to hid this money in several locations on you and the bike. The harder to access, the better, because it’s unlikely that your’e going to need this money on a regular basis. Cash is king in Mexico. Unlike the USA where all restaurants and hotels accept credit cards. Many places in Mexico accept only cash. The best exchange rates are from the ATMs (always better than exchanging USD). While you’re on the road, keep your bank cards in separate locations. Some like to put them in different panniers, others like to keep them in hidden protective gear pockets within riding gear. Taking out cash from an ATM in Mexico is simple. Exercise normal precautions just as you would in the USA. For example, it’s better to go to the ATM during the day rather than at night and make sure no one is looking over your shoulder. Although rare, card scanners and pin skimmers have been found. Give a quick look at the ATM to make sure there are no “additional” features that shouldn’t be there. Even most small towns will have at least one ATM for you get cash in a pinch. Fill your throw away wallet with enough pesos for your daily spending. Enough to pay for meals, tolls, gas, souvenirs, hotels, etc. Whenever you buy something, take cash from this wallet. So don’t pull up to a gas station and pull out a stack of big bills just to pull off one to hand to the attendant. Typically, I like to pull out a week’s worth of local currency each time I go to the ATM. This is a good balance of how frequent you visit the ATM and how much cash you stand to lose for one reason or another.Keep your week’s worth of money in your normal wallet and only access this in a safe place. For example, from the safety of your hotel room, restock your throw away wallet with your needs for the next day. 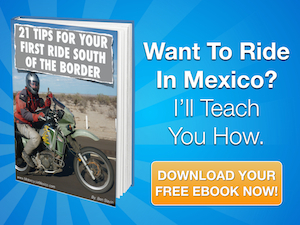 This advice isn’t just for Mexico, it’s good advice no matter where in the world you’re traveling. When you make a cash payment, especially at gas stations, use the lower denomination bill needed and say the amount of the bill(s) that you’re handing over. If you pay with a huge, the attendant has the opportunity to stiff you on the change. Some riders like to hang onto their cash until the attendant has change already prepared. This can work but at some gas stations, the attendant may have to run to a payment window inside the building. Although this scenario unlikely, it can happen. So again, use common sense and travel smarts to prevent this scenario before it happens. In Mexico I’ve never, not once, had a problem with money, money management, obtaining money from an ATM, never been ripped off, certainly never have even come close to getting robbed, nada, zip, nothing.